The role of consequences is simple: To teach. Consequences give children the chance to learn real-world skills from their mistakes and to solve problems. In fact, you want your kids to make as many mistakes as they can while they are young so that they get good at solving problems and facing challenges. That is all a consequence is — an opportunity to learn from a mistake. Many parents get caught up in trying to find the RIGHT consequence that will MAKE their child learn the lesson and never do this horrible act again. It is important to remember that learning takes time. Consequences do teach, but only when they work to solve the problem that the child caused and are delivered respectfully. Not a big deal. Your job is to simply teach your child how to handle mistakes. When you notice yourself escalating or wanting to GET EVEN with your child or MAKE HER PAY, I suggest that you do nothing except acknowledge the problem and let your child know you will deal with it later. It is always better to respond calmly with a consequence that you have the time to implement and that is solution-oriented than to simply take away the iPad, again. Consequences are NOT: painful, physically harmful, disrespectful, or delivered in anger or with condescension. Your child may be inconvenienced or uncomfortable, but never harmed, shamed or belittled. Consequences that create physical pain or danger usually backfire and cause children to lose trust in the adults who care for them the most. Natural consequences are the type that society or nature imposes on your child.The parent steps OUT of the way and allows the consequence to do the teaching. You are loving and supportive of your children as they deal with the response to their actions. Of course, this is never used in dangerous situations, only when you believe your child can actually handle the consequence of their actions. Logical consequences are those that a parent imposes on the child in response to the child’s action. The parent reflects the child’s emotion first and is calm when delivering the consequence. Then the parent requests that the child do what is necessary to solve the problem or correct the mistake. Consequences that are a form of punishment are easy to come up with. However, creating consequences that teach as a form of discipline takes more time and practice. Remember, you are not alone in parenting your child, so reach out for support when you are coming up with consequences. Ask for help from your partner, your friends, a teacher or a trusted mentor. Get a lot of ideas and pick the one that is related to the situation, reasonable and respectful. This is where you trust your instincts. They are good. And if it doesn’t work, you can always try again! Mistakes are our greatest teachers. Want some alternatives to using Consequences? 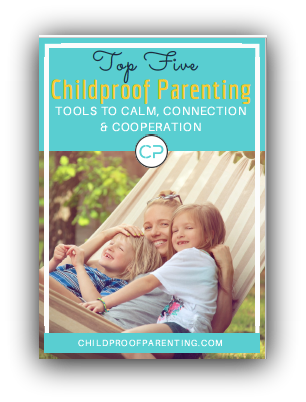 This article was excerpted from The Childproof Parent, co-authored by Melissa Benaroya, LICSW and Robin Dowdy, M Ed.